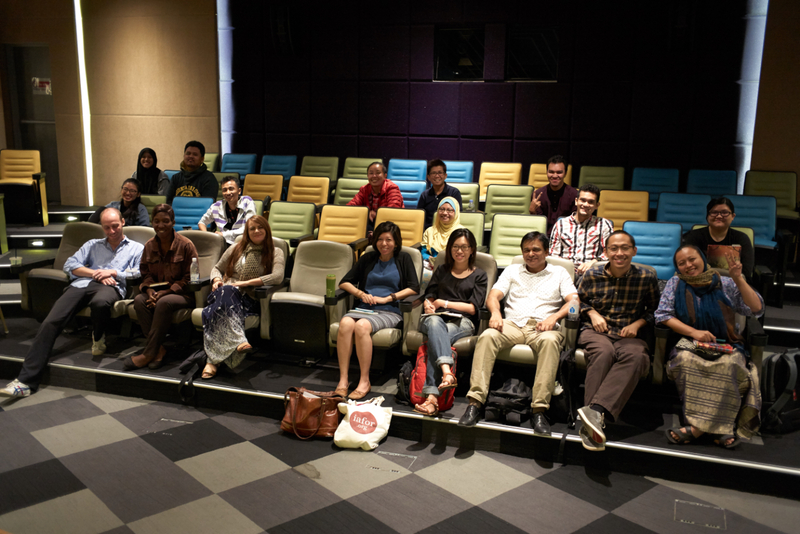 StoryLab International Film Development Research Network ran its first workshop in Kuala Lumpur between the 14th and 16th June 2017. The workshop was hosted by FINAS at their Content Malaysia Pitching Centre in the heart of Kuala Lumpur. We had a wonderful team of 13 participants of varying ages and experience. Some participants were experienced producers and screenwriters with several feature films to their credit, while others were very new to the art and cast of filmmaking. This mixture of experience proved particularly fruitful in our discussions. The workshop was run by Erik Knudsen, Nico Meissner, Sara Kuntoh and Carolina Patiño. Participants included Nik Jasmine Hew, Irene Yap, Ashleigh Chun-Ling Lim, Liyana Noor Effendi, Faqihin Fazlin, Brenda Dankar, Nurul Jannah Nordin, Remy Eldhani, Mei Yee Hooi, Rob Nevis, Luqman Ghazali, Syed Hafiz, Mohammad Thaaqhib Mohammed. Filming the proceedings we were pleased to be joined by Emmy and Izny. The workshop had a particular approach and structure and allowed for very personalised development and engagement. What was particularly successful about the workshop was how participants were able to share and discuss their stories, which were often intimate stories rooted in personal experiences. We set up a private Facebook Group which was used live during our sessions. This is a group that will also be used once we move on to working with our participants in Accra and Ibagué. The idea is that eventually, this Facebook Group will facilitate discussions between filmmakers and writers from across continents who have all been through the same workshop experience. We are very much looking forward to seeing the results of these interactions. Faqihim telling us his story. Irene and Brenda take a break. Some of the most experienced participants, Rob, Mei Yee, Brenda and Ashleigh. In the course of the workshop, a number of powerful stories emerged. Stories rooted in the experiences of participants and finding expression in exciting narrative forms from documentary, fiction, animation to photography. Almost the entire workshop was filmed and we will be editing this together as a part of our analysis of the ‘raw data’ and the completed documentary emerging out of this will, in effect, constitute the StoryLab project’s report. We look forward to continuing developing the cinematic stories with our new friends from Kuala Lumpur.